BANGI, 18 Sept 2012 – The Faculty of Social Sciences and Humanities (FSSH) of The National University of Malaysia (UKM) in a move to rebrand itself has launched its new look web site which is more interactive and user friendly. It provides a comprehensive and up-to-date information about the faculty to students and the public. Associate Prof Fuziah Kartini Hassan Basri from its School of Media and Communication said a committee of seven with representatives from all its centres worked for four months brainstorming and studying websites of other universities locally and abroad to come up with suggestions on how to set it up to meet the needs of all. The faculty’s webmaster, Dr Emma MirzaWati Mohamad from PPMK hopes the new look website can provide all the neccesary information about the faculty to encourage more people to access the site rather than just about its management and administration as was the case previously. Information provided in the new look site is aimed at promoting the faculty to potential students while encouraging visiting scholars to undertake research there. The new look site was developed taking into consideration the university’s autonomy status which allows students to apply directly to the university for enrolment. It is also aimed at promoting the faculty especially the strength of its programmes including its research and the expertise of its faculty members as well as activities of its students’ community. The website use of banner and tagline with the green faculty colour has given it a more vibrant look while being interactive and user friendly. Dr Emma MirzaWati expressed confidence that the new look will encourage more hits. Dr Fuziah said the new look has not only met audit requirements but also the standard for websites as set by the university. Its launch last week was officiated by Director of the Centre for Corporate Communications, Prof Dr Mohd Safar Hasim who said the move was in line with the initiative to promote its various programmes being offered, its expertise and research being undertaken apart from publicising its excellence. 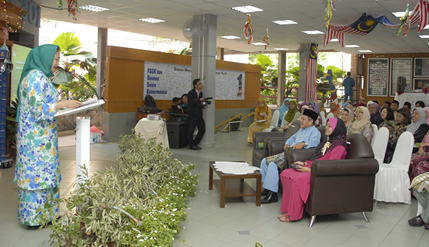 The launch was followed by the Faculty’s Hari Raya do. Dean of the Faculty, Prof Dr Hazita Azman was present.